"I was just finishing breakfast when the call went. The message was a "stand by" call for a potential search for a missing person. The Holme Valley Mountain Rescue Team, based in the South Pennines on the edge of the Peak District, responds to many calls like this, both in the hills and across rural and even more semi-urban areas. Anywhere we can help out where access isn't particularly easy, or search techniques are called for. "It's something I've done for the last eleven years, and over that time it's amazing how little it has interfered with 9-5 working hours. More often than not we get called out when it's dark, or at weekends - when people are playing out in the hills rather than being at work themselves. I have had a number of days at work where I'm struggling to stay awake after being out all night, but can probably count the number of times I've actually responded to calls during working hours on the fingers of one hand. "I got on the phone to the Top Echelons at Planet X. Friday is about the worst possible day of the week for this to happen. It's the day we put the weekly newsletter together and it's all-hands-to-the-pumps to get the content ready and get it sent out. This particular Friday it's even worse - we're short handed already, our former "Head of Content" having just left. "By a quarter to nine I'm in the van with the dog and all the kit and all my work stuff for when it's done - radio in one hand, map in the other - ready for it all to go. Owen talks on a radio in the rain. And yes, That's a Giro Merino Winter Cap... they're pretty warm! "On jobs like this, the Team often gets called in by the Police to help them with searching steep ground, remote areas, places they can't cover with their helicopter and the like. On this occasion though we barely get into our swing before we get some good news. I've parked my van by a gaggle of Police cars, and I'm waiting for the rest of the Team to turn up with the Land Rover, the control van and all the kit. I think about my friend who's missing, and her husband who's been out since midnight looking for her. I decide to give him a call to see how he's doing and find out if there's any more information I can glean. "Almost simultaneously as he answers the phone, Policemen start jumping into their cars and zooming off. He tells me they've found her. By the river. Just across from their house. Owen is an Assistant Leader of the Holme Valley Mountain Rescue Team - based in Marsden, and covering the southern half of west Yorkshire. The team shares operational boundaries with Calder Valley Search and Rescue Team, Woodhead Mountain Rescue Team and Oldham Mountain Rescue Team… there are more of us out there than you might think! Mountain Rescue in the UK, unlike most places in the world, is free and available to all. 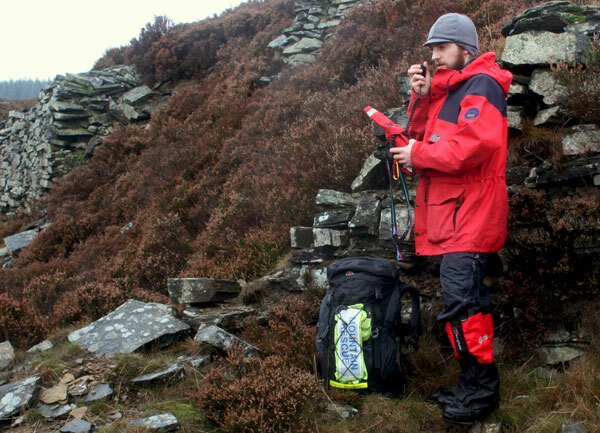 In England and Wales, Mountain Rescue services are entirely run by volunteers and completely non government funded. The service is available 24 hours a day, 365 days a year and is paid for entirely by donations from the public. Mountain Rescue isn't just there to help out in the hills. MR teams respond to rail crashes, aircraft accidents, major incidents, missing person searches, and any circumstances where the traditional emergency services may find access difficult. It also takes an active role in educating people how to enjoy the mountains safely. To call out Mountain Rescue, dial 999. Ask for the Police, then request Mountain Rescue.